It is a perfectly animated volume explosion with full control over its appearance and timings. 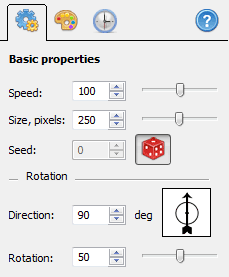 To change the position of the animation, left click and drag it in the view window. The clickable area is marked by blinking angle pointers. Speed - sets the speed of the gases in the explosion cloud. Size - sets the size of the cloud. Seed - selects the sets of parameters for the cloud shape. Toggling the button with the die activates random mode where the shape of the cloud is always unique. Direction - sets the direction of the cloud rotation. Rotation - sets the speed of the cloud rotation. This tab contains controls for the color of the explosion. Translucency - sets the opacity of the whole object. Color 1 - sets the color of the central (hottest) part of the cloud. Color 2 - sets the color of the external (coolest) part of the cloud. 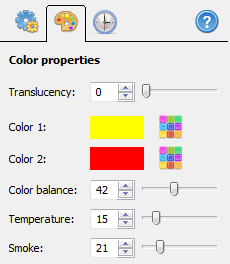 Color balance - sets the position of the edge between color 1 and color 2 in the cloud. Temperature - shifts the whole gamma to color 1 or color 2. Smoke - adds the black tone to the cloud for smoke simulation. This tab contains controls for animation duration. 1st phase - sets the duration of initial explosion and cloud growth. 3rd phase - set the duration of cloud fade. 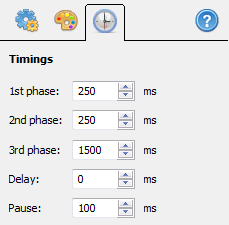 Delay - sets delay before the 1st phase. Pause - sets the pause after the 3rd phase.